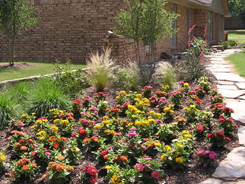 Lawn Care | Allen, TX - TLS Landscape, Inc.
We offer an abundance of different landscaping services to give you the yard of your dreams. Whether you need assistance with planting new flowers and shrubs, removing a tree, installing a patio, or we've got you covered. TLS Landscape, Inc. in Allen, Texas, is a professional lawn care maintenance company the specializes in lawn care services. We provide patio designs and create gardens, retaining walls, and more. We're owned and operated by the Story brothers, Scott and Todd, and we service customers throughout Allen, as well as Dallas and Collin counties. We work with residential, estates, and small commercial clients. We offer customized designs that are specifically tailored for each customer, climate, and budget. Our staff is educated, licensed, and certified in all areas related to landscape services, and pest control in order to better serve you. No matter the size of the job, we'll provide friendly and professional service. We have more than 20 years of experience providing our services and first got started back in the early 1990s. The business was founded by Tom Sawyers, and Scott and Todd joined later, adding their own unique set of skills to the mix. Since the business started, TLS Landscape, Inc. has grown into a full-service company capable of meeting all your landscaping needs.